Every day our kidneys tackle the daunting task of continuously cleaning our blood to prevent waste, salt and excess fluid from building up inside our bodies. To achieve this, the kidneys' approximately one million filtration units (glomeruli) first remove both waste products and precious nutrients from the blood stream, then specialized structures known as the proximal tubules reabsorb the "good" molecules returning them to our bloodstream. While the reabsorptive functions of the proximal tubule can be compromised by drugs, chemicals, or genetic and blood-borne diseases, our understanding of how these effects occur is still limited. To enable the study of renal reabsorption outside the human body, Wyss Institute Core Faculty member Jennifer Lewis, Sc.D., and her team working within the Wyss Institute's 3D Organ Engineering Initiative that she co-leads, and in collaboration with the Roche Innovation Center Basel in Switzerland, created a 3D vascularized proximal tubule model in which independently perfusable tubules and blood vessels are printed adjacent to one another within an engineered extracellular matrix. 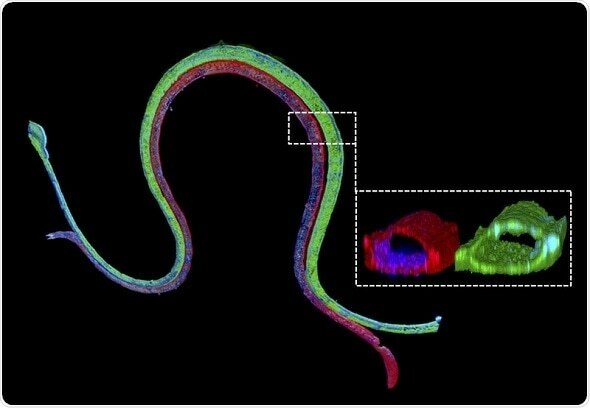 This work builds upon a continuously perfused 3D proximal tubule model reported earlier by the team that still was lacking a functional blood vessel compartment. Using their next-generation device, the team has measured the transport of glucose from the proximal tubule to the blood vessels, along with the effects of hyperglycemia, a condition associated with diabetes in patients. Their study is published in the Proceedings of the National Academy of Sciences (PNAS). Lewis is also the Hansjörg Wyss Professor of Biologically Inspired Engineering at Harvard John A. Paulson School of Engineering and Applied Science (SEAS), the Jianmin Yu Professor of Arts and Sciences and a member of the Harvard Stem Cell Institute. "We construct these living renal devices in a few days and they can remain stable and functional for months," said first-author Neil Lin, Ph.D., who is a Roche Fellow and Postdoctoral Fellow on Lewis' team. "Importantly, these 3D vascularized proximal tubules exhibit the desired epithelial and endothelial cell morphologies and luminal architectures, as well as the expression and correct localization of key structural and transport proteins, and factors that allow the tubular and vascular compartments to communicate with each other." As a first step towards testing drugs and modeling diseases, the team induced "hyperglycemia", a high-glucose condition typical of diabetes and a known risk factor for vascular disease, in their model by circulating a four-fold higher than normal glucose concentration through the proximal tubule compartment. "We found that high levels of glucose transported to endothelial cells in the vascular compartment caused cell damage," said Kimberly Homan, Ph.D., a co-author on the study and Research Associate in Lewis' group at the Wyss Institute and SEAS. "By circulating a drug through the tubule that specifically inhibits a major glucose transporter in proximal tubule epithelial cells, we prevented those harmful changes from happening to the endothelial cells in the adjacent vessels." The team's immediate focus is to further scale up these models for use in pharmaceutical applications. "Our system could enable the screening of focused drug libraries for renal toxicity and thus help reduce animal experiments," said Annie Moisan, Ph.D., a co-author and industry collaborator on the study, and Principal Scientist at Roche Innovation Center Basel. "I am thrilled by the continued efforts from us and others to increase the physiological relevance of such models, for example by incorporating patient-specific and diseased cells, since personalized efficacy and safety are the ultimate goals of predicting clinical responses to drugs." "Our new 3D kidney model is an exciting advance as it more fully recapitulates the proximal tubule segments found in native kidney tissue," said Lewis. "Beyond its immediate applications for drug screening and disease modeling, we are also exploring whether these living devices can be used to augment kidney dialysis." Currently, life-saving dialysis machines filter blood, but they are unable to retrieve precious nutrients and other species from the filtrate that the body needs for many of its functions, which can cause specific deficiencies and complications down the line. Lewis and her colleagues believe that 3D bioprinted vascularized tubules may lead to improved renal replacement therapies. "This study presents a significant step forward in human kidney engineering that enables human disease and drug-related studies to be carried out over extended periods of time in vitro. It also represents a major step forward for the Wyss Institute's 3D Organ Engineering Initiative, which aims to generate functional organ replacements with enhanced functionalities for patients in need." said Wyss Institute Founding Director Donald Ingber, M.D., Ph.D., who is also the Judah Folkman Professor of Vascular Biology at HMS and the Vascular Biology Program at Boston Children's Hospital, as well as Professor of Bioengineering at SEAS.